Valentine’s Day is for celebrating the ones you love, whether that’s your family, a significant other, or your friends (like Galentine’s Day!). This holiday revolves around the heart, and yours should be as healthy as possible. After all, when you have love in your life, you want to live to be 100! These heart-healthy date ideas in the Charlotte area will help you and your sweetheart get in shape while having fun. 1. Run (or walk) a 5K! Running has all kinds of benefits. It lowers your risk of heart attack, and even a five minute daily jog can reduce your risk of heart disease. Runners live an average of three years longer than non-runners – that’s three more Valentine’s Days with your loved ones! Luckily, there’s no shortage of 5Ks in Charlotte on Valentine’s Day. If you’re feeling adventurous, strip to your skivvies and try Cupid’s Undie Run, or dare to brave the icy depths of the Frigid 5K Run & Plunge at the U.S. National Whitewater Center. The Puppy Love Run is a tamer option, and it’s a virtual run, which means you can do it anywhere on your own time (and still get a medal!). Whether you’re the next Michelle Kwan or you’ve never set foot on the ice, ice skating is a guaranteed good time at the Pineville Ice House, located just a short drive from Charlotte. The schedule is pretty packed on Valentine’s Day, but there’s public skating from 1:15 pm until 4:30 pm, and from 7:30 pm to 10:30 pm. If you’re feeling competitive, stick around: an adult pickup hockey game for intermediate players starts at 10:45 pm! Trust is essential to any relationship or friendship, and rock climbing requires plenty of faith in your partner. At the Inner Peaks Climbing Center on Monroe Road, you’ll put that trust into action. There’s over 13,000 square feet of climbing terrain, with paths for any experience level. They also offer an Intro to Climbing class from 1:00 pm to 4:00 pm on Valentine’s Day. Get heart healthy and improve your relationship! 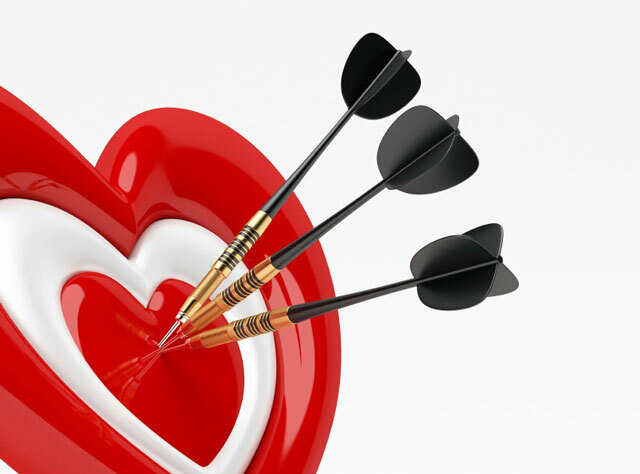 Play Cupid as you practice shooting a bow and arrow at Barefoot Archery, located on Old Pineville Road in Charlotte. For just $50, you can have a private lesson where you’ll learn all the basics of archery as you practice your form and work on your shooting skills. While you may not think of archery as a cardiovascular sport, it takes considerable focus, upper-body strength, and coordination. Plus, it just looks cool! The weather has been unseasonably warm lately, so it’s the perfect time to take a walk or hike your way through nature. Summer (and swimsuit season!) will be here before you know it, and hiking has been proven to make you happier and healthier. There are hundreds of miles of hiking trails around Charlotte, so you can find one that’s just right for you and your valentine. If it’s puppy love you’re feeling, there are even dog-friendly trails for the whole family. There are tons of reasons to focus on heart health throughout the year. You know it’s important, but maybe you haven’t gotten around to exercising in a while. Your valentine already makes your heart pound, but this holiday is the perfect opportunity for a little romantic cardio. Working out with a partner improves your results, and you might even make it part of your quality time together throughout the year!